Early this year, I set out to find an iPad app that I could enjoy using to manage my finances. After a couple of days of looking, I settled upon MoneyWiz from the developer SilverWiz. Its developers describe it as "beautiful, powerful and easy to use", and having stuck with the app since late January I'm inclined to agree. In my reviews of the iPad and Mac versions my overall take was mostly positive (there is also an iPhone version, but that I have yet to use). After exchanging a few emails with Iliya Yordanov, the founder of SilverWiz, I thought it would be interesting to have a Q&A with him and learn a bit more about the app, similar to what we've done in previous interviews here on MacStories, but this time, I decided to change things up a bit. For this interview I've assembled all the various stories about MoneyWiz and the SilverWiz company that Iliya shared with me into a single story that (hopefully) gives you a fascinating and unique look behind the app and company. Disclaimer: At the time of publication SilverWiz is one of the advertisers on MacStories; however, this article was in the works before the campaign began. Advertising on MacStories is not handled by editors but by BackBeatMedia, and has no relation to editorial content whatsoever. The River Test - A free puzzle game that was downloaded over 3 million times. Iliya told me it was frequently used in Japan in job interviews. 18,000 Cool Jokes - contained many jokes organised by category that could be rated, sorted by rating, and so on. 23,000 Great Quotes - contained many inspirational quotes. MoneyWiz was born out of Iliya's need for an app to manage his money once he had quit his former job to start Cramzy. 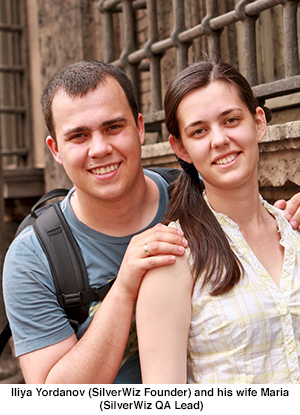 Despite searching for days and trying various apps, Iliya was unsatisfied with what he found. Nothing was remotely close to the ideal things he wanted from a finance app: simplicity, beauty, and syncing. So, like many developers before him, he decided to make his ideal app himself. It didn’t happen instantly though; about a year went by before active development began in 2010. 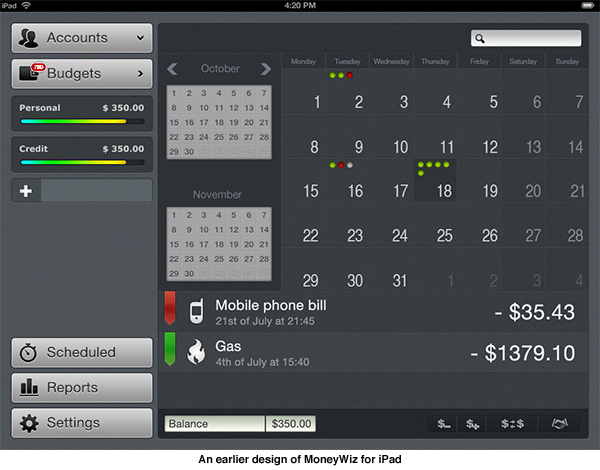 The original plan was to release the first MoneyWiz app (for iPad) in August of 2010. But as can so often happen with new companies and big projects, deadlines can be set ambitiously early, and as Iliya later admitted, they were utterly naïve of the enormity of the task they had set themselves. 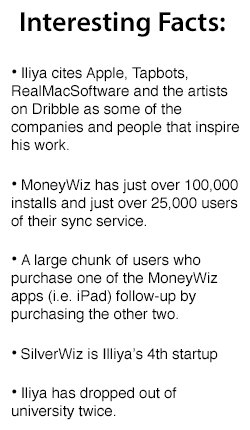 It was not until nearly a year later, in June 2011, that MoneyWiz for iPad finally launched. The design was one of the key reasons that the app was delayed. Initially the app had a totally different design than it does now, but it wasn't in line with what Iliya was looking for. They ended up hiring a new designer to completely re-design it from scratch, which was no small undertaking. Even the code had to be redone because the workflow of the app had changed, as did various animations and the navigation hierarchy. But it was developing the sync service (both the user-facing and server-side aspects) that was the biggest delaying factor. Initially expected to take about a month, the sync system ended up taking over six months to develop and then another month or so of testing and fixing. During this period of development, whilst SilverWiz was generating no income, they were being funded by the success of Iliya's initial iOS App Store venture, Cramzy. The launch of MoneyWiz for iPad in June 2011 didn't turn SilverWiz into a profitable venture either, so Cramzy continued to help keep them above water for about another year. 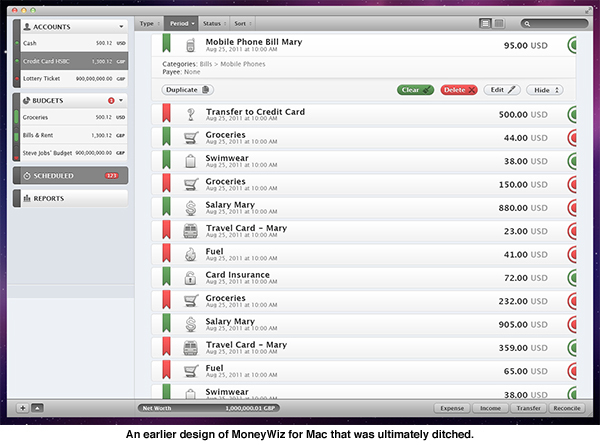 The launch of the iPhone version of MoneyWiz in October 2011 made the financial situation "better, but not significantly", but it was the Mac version of MoneyWiz in May of this year that really saw MoneyWiz succeed. Iliya puts this down to the fact that people want great personal finance apps for the Mac and because it means they now have "the whole package" — apps for the iPhone, iPad, and Mac, with sync that seamlessly connects them all. Understandably, the period before SilverWiz became sustainable was frightening for Iliya and the rest of the company. Cramzy was the only thing funding the MoneyWiz project — a project that the team was now focusing on completely with the "blind hope that things will eventually turn out OK". Of course it didn't help that sales from the Cramzy apps were slowing down with the team's entire focus now on MoneyWiz. They resisted the temptation to revive Cramzy, telling themselves that they were making a great product. Iliya says that one of the things that drove him to keep development going was the nagging feeling that if he had abandoned MoneyWiz he probably would have looked back and regretted it in the future. When you don't have the money to advertise and no connections to get some media coverage, things don't look so optimistic and you've got to find something in you to keep you going. It sounds almost a little cliched, but in my correspondence with Iliya he told me on multiple occassions that once he was set on making MoneyWiz, he wouldn't look at competing apps until it was released. He wanted to avoid the temptation of copying what others had already done and ensure that MoneyWiz was "truly unique and intuitive". That certainly paid off, but it also meant that it took him and his team weeks to figure out how to make many of its features, such as split payments and different balance views, work effectively from a user's perspective. It just happens that many people are ready to let go of the old habits and switch to a modern and unique product such as MoneyWiz. The result is that we're happy doing what we do, and we can support ourselves financially. From sales point of view, our only competition is Quicken. It is perhaps this attitude, combined with the idea of doing things the right way, that has been a double-edged sword for SilverWiz. On the one hand, it means that features tend to be really good when they're done, but on the other hand, it has meant that MoneyWiz has lacked some relatively important features that its competitors have. One example that Iliya shared with me are refunds — typically people handle them by entering the expense amount as a negative value. Whilst it leads to mathematically correct results, he and his team believe it isn't as intuitive to those new to personal finance apps, so they're now working on native refund functionality "that makes sense". Allowing a minus sign is a 2 minute job. Figuring out how to handle refunds, make the UI for it, the calculations, reports and all…well that takes time. The core team of SilverWiz consists of 6 people: Iliya, his wife Maria (who heads up Quality Assurance), three developers, and a customer support specialist. The company also employs about 15 other people part time, including a lawyer, a PR consultant, a video producer, two accountants, testers, and translators who work on localizing MoneyWiz into 19 languages (with more planned for the future). Implementing sync is no easy task (just ask Cultured Code) and for SilverWiz it was no different: as you may recall, it was syncing that really delayed MoneyWiz's initial launch. Perhaps the whole reason why it is difficult is because they, like Cultured Code, decided to implement their own sync system. Looking at the main alternatives, iCloud and Dropbox, there were just too many limitations that would either restrict the advancement of MoneyWiz or cause major headaches at a later date that would require them to eventually develop their own system anyway. 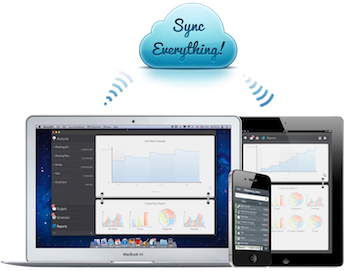 The big problem with iCloud and Dropbox was that they would require MoneyWiz to update and then sync an entire database file whenever changes were made, which can lead to conflicts and bandwidth issues with large databases. On top of that, iCloud had additional issues because it could cause problems if a family wanted to share access to MoneyWiz across different iCloud accounts, not to mention the fact that MoneyWiz would be restricted from any future web or Windows apps. But the drawback of these platforms is that none of them can technically provide such a smooth syncing experience. And that's one of the things that makes MoneyWiz unique. We prefer to invest time and money into making our sync better, rather than wasting time on integrating it with other platforms that aren't so good for what our customers need. It had to be reliable… meaning no downtime. It had to properly figure out what to do in all sorts of situations, like when you have many devices, some online, other offline, and you make changes on all of them at the same time. It ultimately took the team two months to figure out how to accomplish these goals, followed by more than six months to develop the system and test it. Their sync system works by sending only the changes that are made to the database — more specifically, the commands that describe what you have done — rather than the entire database file. So every 20 seconds, MoneyWiz will send a 'revision' to the sync server that describes all the commands done on a particular device since the last revision. When you then go to another device, it will download any revisions that it is missing. This also allows the ability to revert back to a previous — a function that, while not currently available to users, has the potential to be in the future. A more thorough explanation of their sync system can be found over at the SilverWiz blog from when Iliya explained it in April of this year. The rest of their time is spent fixing bugs (about 20%) and implementing other features that haven't been requested per se, but are on their internal development roadmap (40%). I've seen all kinds of stuff in the Support team, from people inviting us to visit them in their country, to people who threaten us. I've actually made new friends, answering to customer mails, and it's quite a rewarding experience… you wouldn't imagine writing an e-mail to a software company to ask how to plan your Groceries budget, and end up sharing cocktail recipes and photos of your dog…but it happens and I love it. It's fun. When I asked Iliya what his most gratifying and depressing moments have been since releasing MoneyWiz, he listed the same event under both categories: the 1.3.1 update. It was an update that included a last minute fix that the developers almost forgot to add, and because it was added in at the last minute, it didnt go through their normal testing and validation. It subsequently caused a seperate, critical bug that led MoneyWiz to crash on launch. As soon as the update went live, their support email was flooded with over 600 emails over the following 24 hours. Iliya explained how he was fascinated that the App Store reviews were almost evenly split between angry and positive. MoneyWiz's loyal customers helped the company out, boosting the ratings and writing positive reviews, hopeful that a fix would soon be released. Fortunately, the developers figured out the bug and submitted a new version to Apple within 24 hours. It was because of the loyal MoneyWiz fans and their support that we managed to get back on our feet and I couldn't be more thankful to them. It was one of those reality check moments, I suppose, and looking back at it, I find it fascinating that we managed to make so many extremely loyal clients. It sets the bar high for us to never screw up like that again, and not disappoint our fans. Look at what the other finance apps do - many of them appear cheap, but they are full of in-app purchases. So if you want PDF reports - boom - pay 5 bucks more, if you want crappy sync - boom - pay 10 more bucks and so on. I despise such practices. They just show you are in all this just for the money and you have no respect of your work and your clients. We'll never go there, no matter what! So even if MoneyWiz appears more expensive, if you sit down and do the math, you will see that it's currently one of the cheapest apps out there. Originally based in Bulgaria, Iliya and Maria moved to San Francisco recently after living and working in London for two years. He said that earlier this year they had felt the urge to explore and live somewhere new and unfamiliar, and after a friend of Iliya's suggested San Francisco they decided to go for it. So far, it's been a month here and I really love the place, but most of all I love the social environment. Everybody's a geek, every second person is an entrepreneur. Traditional logic and rules don't seem to apply, and people seem to be so disconnected from the real world at times, trying to invent the next big thing. I love this. It's crazy, but for me - that's the spirt of the Silicon Valley and I love being a part of it. So where does Iliya and his team plan to take MoneyWiz in the months and years to come? Iliya tells me that incremental updates will continue throughout the rest of 2012, but next year work will begin in earnest on MoneyWiz 2.0. It will be a big update that is planned to arrive in Summer 2013, and they envisage it will bring many user interface improvements, including more interactivity. Given discussions earlier this year regarding Apple's reluctance to introduce paid upgrades in their App Stores, I asked Iliya about his thoughts on the issue. He said that their current plan is to release MoneyWiz 2.0 as a separate app, but that he would "love the option for paid updates". He explains that it would easily inform users that a newer version is available and also circumvent the issue of old URLs linking to version 1.0 becoming dead links. The SilverWiz team is also working on a new app, completely unrelated to personal finance, that Iliya seems really excited about. He didn't want to reveal what it was to me, but teases with the bold suggestion that it's something "the industry has never seen before". Hopefully we won't have to wait too long to see whether it lives up to that.